All offers are subject to availability. Selection varies by store. These offers are valid for new purchases only. Discounts may not be applied to gift center purchases/engravables, Exceptional Value and custom items, tuxedo rentals or the fees and taxes associated thereto, alterations or toward the purchase of gift cards. Deals cannot be combined with other promotional offers or discounts. Customers returning items purchased will forfeit the portion of the discount used for those items. The Men's Wearhouse return policy will apply to the remainder of the purchase. Perfect Fit® points are earned only on amounts expended by you in connection with the purchase and are deducted for any returns. 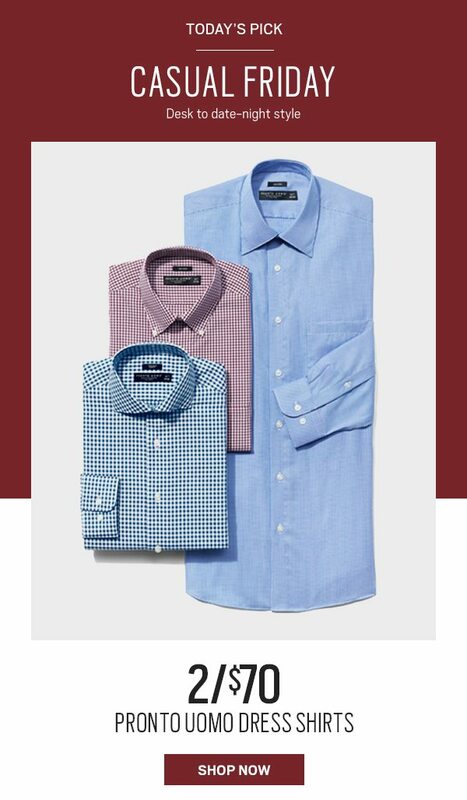 2/$70 PRONTO UOMO DRESS SHIRTS: select styles only. Additional charge for Big & Tall sizes. Excludes Exceptional Value & clearance items. 2 shirts must be purchased to receive discount. If either shirt is returned, the discounted item must be returned or purchased at current price. Cannot be combined with other promotions. Valid 2/12/2019 (until 11:59PM CT) only. FREE SHIPPING: All orders over $99 (not including tax) purchased on the website are eligible for free standard shipping. Excludes gift center purchases. Orders will take 1-2 days to process (plus an additional day if placed on weekends or holidays). 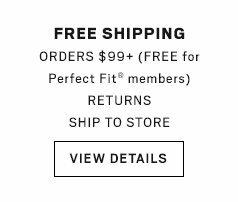 Perfect Fit members get free standard shipping (no minimum spend) on every online order. Perfect Fit members must have an online account and their nine-digit Perfect Fit Rewards number associated in their profile under "My Account: Perfect Fit Rewards." When you are ready to check out, please login to your account and select the "Standard Shipping" option. Please note: This promotion can be discontinued at any time and may not be combined with other offers. © 2019 The Men's Wearhouse. All rights reserved.